Earl Kenneth Hines, known as Earl "Fatha" (for "Father") Hines (December 28, 1903 – April 22, 1983), was an African-American jazz pianist. Earl Hines is one of jazz music’s most legendary pianists and one of the greatest. His airy, volatile rhythmic sense makes him immediately recognizable and stands in stark contrast to the more massive quality of the Harlem stride style that developed around the same time. Hines’ style is also known as “trumpet style,” because his right hand’s octaves played the melody on the piano much in the same way as a trumpet would. Though the nickname “Fatha” indicates the immense respect younger pianists always had for him, Hines’ style was far too unique to be easily imitated. The rhythmic complexity of his music also makes Hines a precursor of modern jazz. Earl Hines was born in the Pittsburgh suburb of Duquesne, Pennsylvania. His father was a brass band cornetist and his stepmother a church organist. Hines at first intended to follow his father's example and play cornet but "blowing" hurt him behind the ears—while the piano didn't. He took classical piano lessons but also developed an ear for popular show tunes and was able to remember and play songs he heard in theaters. Hines claimed that he was playing piano around Pittsburgh "before the word 'jazz' was even invented." Unlike that of most jazz musicians, Earl Hines' long and distinguished career can be divided into four clearly distinct phases in which he excelled in different ways. After his initial years of training, Hines became the main partner of young Louis Armstrong in his revolutionary years (mid to late 1920s). In the 1930s, Hines led his own successful big band. Towards the end of the 1940s, Hines found himself playing again with Louis Armstrong as part of Louis’ “All-Stars.” This was a more traditional period that was continued by a few years of playing Dixieland on the West Coast. Finally, after a period of inactivity and little press, Hines spent the latter part of his life as a star of his own, playing around the world in solo and small group performances. At the age of 17, Hines moved away from home to take a job playing with Lois Deppe, a singer, in a Pittsburgh nightclub. His first recordings were with this band—four singles recorded with Gennett Recordings in 1922. Around 1923, he moved to Chicago, Illinois, then the world's "jazz" capital, home (at the time) to Jelly Roll Morton and King Oliver. He played piano with Carroll Dickerson's band and made his first acquaintance with Louis Armstrong. …with Earl Hines arriving on piano, Armstrong was already approaching the stature of a concerto soloist, a role he would play more or less throughout the next decade, which makes these final small-group sessions something like a reluctant farewell to jazz's first golden age. Since Hines is also magnificent on these discs (and their insouciant exuberance is a marvel on the duet showstopper "Weather Bird") the results seem like eavesdropping on great men speaking almost quietly among themselves. There is nothing in jazz finer or more moving than the playing on "West End Blues," "Tight Like This," "Beau Koo Jack," & "Muggles." Hines's solo recordings from that year, notably his own composition "My Monday Date," provided titles reused much later in Hines's career. After a brief stay in New York, Hines returned to Chicago, where he ended up in Jimmie Noone's band at the Apex Club. In 1928 (on his 25th birthday), Hines began leading his own big band. For over 10 years his was "The Band" in Al Capone's Grand Terrace Cafe—Hines was Capone's "Mr Piano Man." From the Grand Terrace in centrally located Chicago, The Earl Hines Orchestra broadcast over many years, coast to coast across America. Hines's band became the most broadcast band in the nation. Hines led his big band until 1947, taking time out to front the Duke Ellington orchestra in 1944, while Duke was ill. Though the Hines' band never became a “classic” big band like those of Duke Ellington or Count Basie, and though Hines remains primarily a great soloist in the history of jazz, his big band produced a considerable amount of wonderful music. The leader’s acrobatic piano often provided an exciting contrast to the band’s homogeneous mass, but sometimes the entire band would pick up the piano’s jumpy, airy quality, thus creating a unique sound, as in Tiger Rag where the alto saxophone and trumpet solos continue in exactly the same vein as Hines’ piano solo. Hits by the Hines band include “Cavernism” (1933), “Boogie Woogie on the St. Louis Blues” (1940) “Jelly, Jelly” (vocal by Billy Eckstine), and Hines’ most famous composition, “Rosetta” (1933). For several years, the band benefited from the presence of the great arranger Jimmy Mundy and at various times it included musicians such as trombonist Trummy Young, tenor saxophonist Budd Johnson, trumpeter Ray Nance, and singer Billy Eckstine. Even more importantly perhaps, the Hines Orchestra became the starting point for the careers of Charlie Parker, Dizzy Gillespie, Sarah Vaughan, and other pioneers of bop. Not unlike tenor saxophonist Coleman Hawkins, with whom he made some excellent studio recordings, Hines had the necessary creativity and flexibility to become part of the be-bop revolution in its early stages. 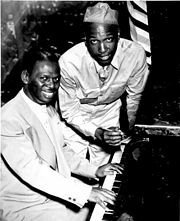 Forced to disband in at the end of the big band era in the late 1940s, Earl Hines joined Louis Armstrong’s newly created “All-Stars,” a small group of mostly outstanding musicians playing an updated version of what essentially remained Louis’ initial style. The group propelled Armstrong to world fame. Though he was certainly at ease playing with his old friend and other familiar musicians in a traditional style, Hines undoubtedly aspired for something more. Nevertheless, when leaving the All-Stars in 1951, Hines found himself fronting another Dixieland-style small formation on the West Coast. The band, often including white trumpeter Mugsy Spanier, fit into of the Dixieland nostalgia of the time and was somewhat remote from Hines’ own sophistication. At the start of the jazz-lean 1960s, Earl Hines settled in Oakland, California, and came close to giving up the profession. Then, in 1964 he was suddenly rediscovered by jazz critic Stanley Dance and performed in a series of concerts in New York. He then became the 1965 "Critics' Choice" for Down Beat Magazine's "Hall of Fame." From then till he died he recorded endlessly both solo and with jazz notables like Buck Clayton, Roy Eldridge, Ella Fitzgerald, Paul Gonsalves, Lionel Hampton, Coleman Hawkins, Johnny Hodges, Jimmy Rushing, Stuff Smith, and Ben Webster. Not surprisingly, the list also includes much more modern players like Elvin Jones and Charles Mingus. But his most acclaimed recordings of this period were his dazzling and endlessly inventive solo performances, which could show him at his very best, "a whole orchestra by himself". Solo tributes to Louis Armstrong, Hoagy Carmichael, Duke Ellington, Cole Porter, and George Gershwin were all put on record in the 1970s. Hines also toured Europe again regularly at this time, and added Asia, Australia and the Soviet Union to his list of State Department–funded destinations. On his world tours, Hines would often play in a rhythm trio including drummer Oliver Jackson, with the additional presence of tenor saxophonists Lucky Thompson or Buddy Tate. It is not uncommon for jazz musicians to have their significance recognized after a period of obscurity when their style was considered out of date. However, the revivals of their careers have been either short-lived (like the Boogie-Woogie craze around 1940), or the musicians did not live long enough to really benefit from the revival (for example, Jelly-Roll Morton), or their capacity to perform had declined so much that they were mostly enshrined as historical curiosities. Hines is a rare case of a jazz great whose style slowly matured to perfection after an already brilliant beginning—thus making him both a precocious player and a late bloomer. Whether playing solo or with his small ensemble (he would alternate on the same night), Hines thus played with the perfection of maturity without missing any of his original vitality. The last few years of his life are without question the ones where he could be most fully appreciated as a piano great. In 1975, he made an hour-long "solo" film for British TV out-of-hours in a Washington nightclub: The New York Herald Tribune described it as "The greatest jazz-film ever made." He played solo in The White House and played solo for the Pope—and played (and sang) his last job a few days before he died in Oakland, quite likely somewhat older than he had always maintained. If Hines stands as a lonely giant, rather than as the main figure of a school or style, he nevertheless exerted considerable influence on many pianists, including a young Count Basie, Teddy Wilson, Nat King Cole, Erroll Garner, Mary-Lou Williams, Ahmad Jamal, and numerous modern pianists. In spite of his age and the fact that his style remained anchored in traditional jazz, some have thus called him the first modern jazz pianist. Hines’ sense of rhythm was unparalleled. He was capable of juggling with notes and silences alike, never losing control, though always seeming to be on the brink. His touch was light but incredibly intense, as if he was hitting the keys with a hammer. The intentionally uneven rhythmic dialogue between the right and left hands, with sudden stops as if he were stumbling on purpose, didn’t prevent him from developing beautiful melodic lines and an intense swing effect. When fronting his band, he was also perfectly capable of including sequences where his left hand would stomp evenly like the stride pianists did. Hines’ style can be contrasted with that of Art Tatum. Tatum’s extreme virtuosity allowed him to play massive amounts of notes and chords in a ceaseless sequence, whereas Hines would make his equally brilliant moves without ever settling for a fixed pattern. ↑ Donald Clarke, "Hines, Earl," MusicWeb Encyclopedia of Popular Music. Palmer, Robert. 1981. "Pop Jazz; Fatha Hines Stom[p]ing and Chomping on at 75," The New York Times. August 28, 1981. Earl "Fatha" Hines. The Red Hot Jazz Archive. This page was last modified on 26 September 2017, at 15:32.